YAY college! My first few weeks here at Texas Tech University have been amazing. It’s been fun meeting people and starting classes and embracing dorm life. 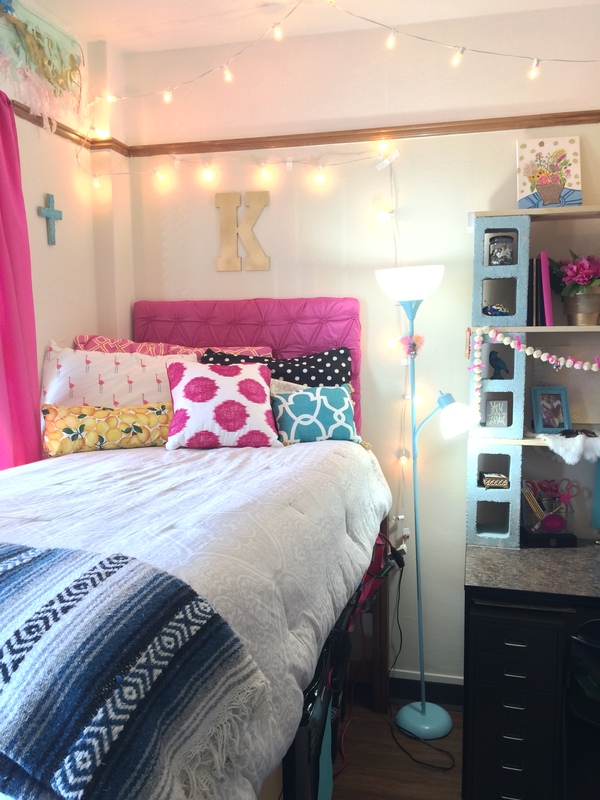 Here are some pics of my dorm. I share the room with my roomie, but here is my side. 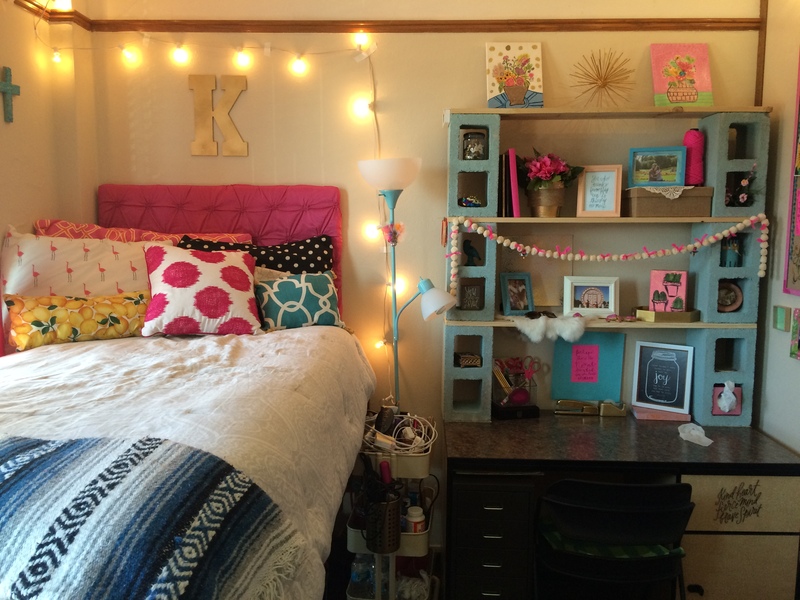 After months of pinning, designing, crafting and shopping, i am all moved in! The desk and shelving has to be my favorite part of the room. It’s so fun and unique, no one else has it- that’s the coolest part of making it yourself. 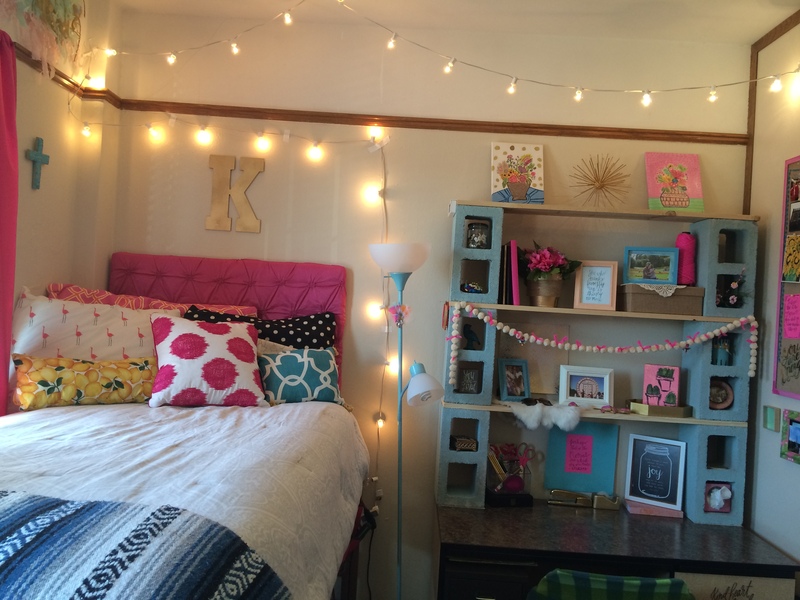 I love my room because it is an expression of my personal style and creativity. Most of what makes my side of the room special is the handmade touches. The shelves on my desk are my favorite part. I created the shelves by buying wood and cinder blocks from Home Depot. I like the retro uniqueness it brings to the room. My mom and I spray painted the cinder blocks light blue and then arranged the blocks with the wood as shelves on top of my desk. This entire project cost around $17. The shelves make the room stand out and feel more homey. I like the extra display space that they provide as well as allowing more room for self expression; On the shelves I have arranged special framed photographs and the paintings I made of cacti and flowers. The shelves are full of fun knick knacks that remind me of what makes me, me. 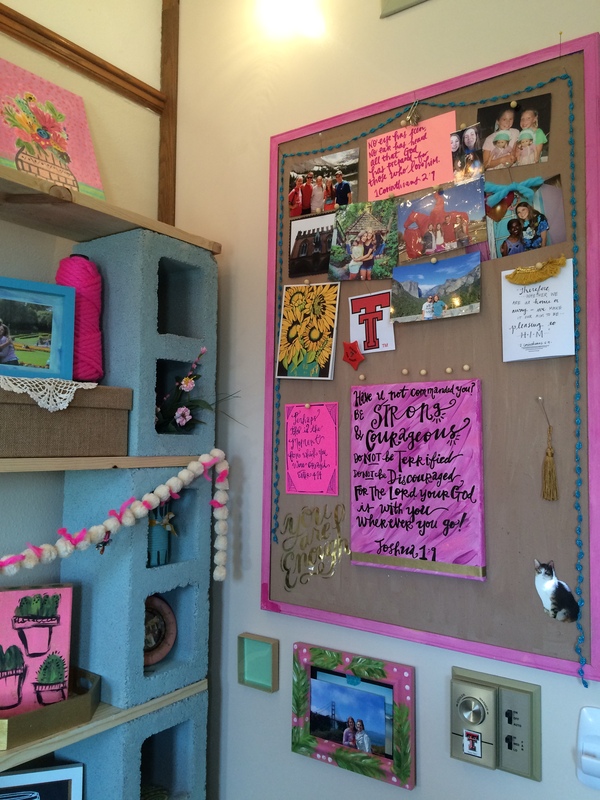 I used scrapbook paper to display inspirational quotes and encouraging verses. And the lights above the desk and bed.. yes i know they are so basic. but come on it’s so college and cute. I added a pom pom garland on the middle shelf and used a removable sticker from hobby lobby on the wooden desk drawer to make it more decorative. I also purchased an IKEA rolling drawer cart to store my school supplies and craft items. I decorated with a retro teal mini trashcan, matching my spray painted blue lamp. I love my bed. It is lifted up as high as it can go, allowing for the ultimate storage of my fridge and dresser underneath the bed. On the bed I have decorated with Kate Spade grey bedding which is sold out everywhere & would usually cost $200, I got a bargain when I purchased at a garage sale for only $5. The simple grey print called for exciting pops of color in pillows. 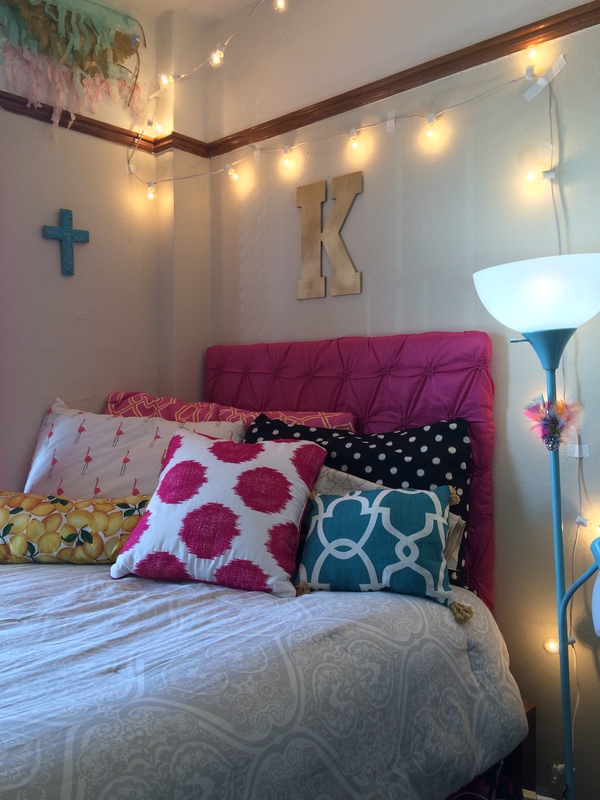 I decorated mostly with pillows that I have sewn myself. I wanted my bed to be cozy and comfortable, so by creating my own throw pillows with my favorite fabrics and patterns it turned out exactly how I imagined. It really makes the bed feel extra home-y. I love how they are all unique. I have a lemon printed pillow, a pillow with flamingos and a pillow with black and white spots among other designs. The blue tribal blanket adds a semi hipster touch to the room! My mom made the head board. YES, we MADE it. 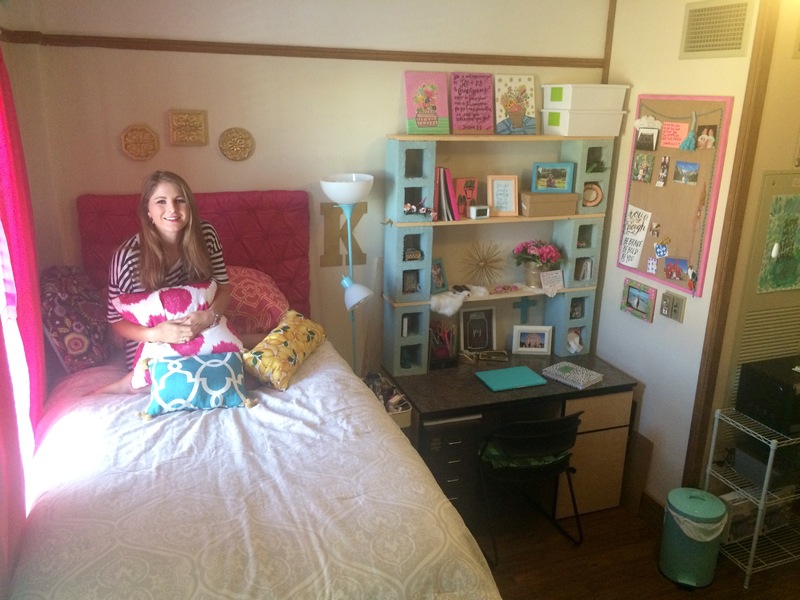 She saw a $115 fabric dorm headboard online, and decided to recreate it. We bought some silky fabric and stretched it out over a large flattened cardboard box with quilting batting behind the fabric to add cushion. We taped it all onto the cardboard and propped it up behind my bed, securing it with several command strips. My room proves that craft projects can make dorm decorating more personal and less expensive. 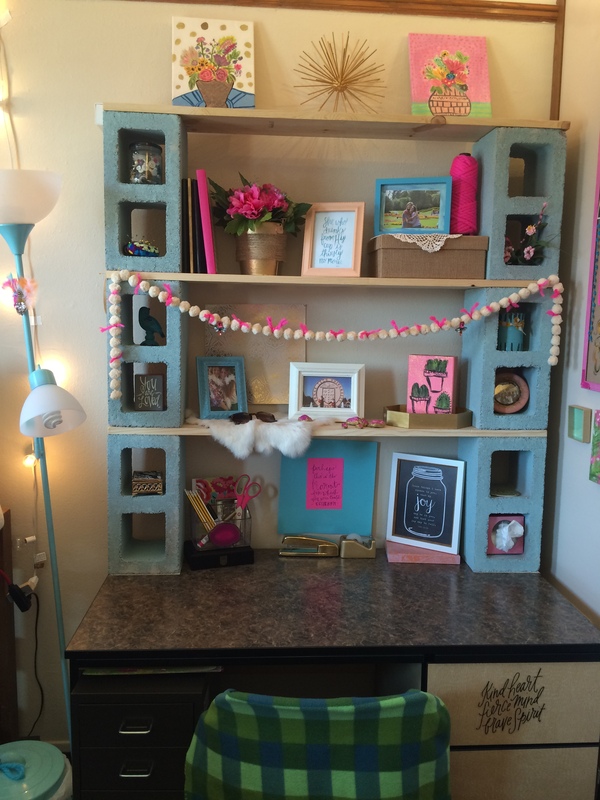 I had a blast brainstorming ideas for my room and crafting in order to create my dorm space my own. It was a fun process and I love having the opportunity to show off my space. 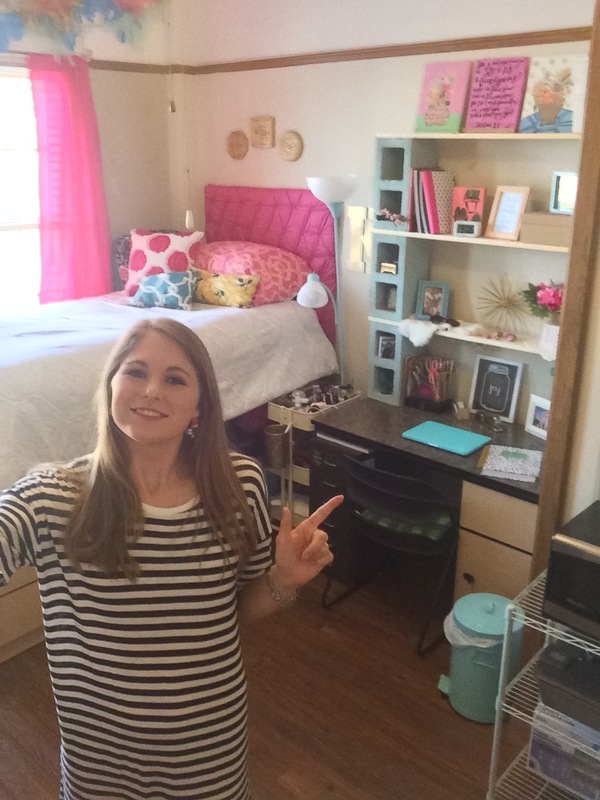 Wreck eEm’ Red Raiders and here’s to freshman year! I want to pack for CSU. It’s 6 months away and first, I have to at least make it through this semester, but I want to pack for Colorado. Plans are being discussed, arrangements being finalized, and this 6 week adventure is in the foreseeable future. Memories of summer 2013 are growing sweeter and making themselves more comfortable in my mind, all while building upon the escalating anticipation for the summer of 2015. Maybe there’s something I can do to draw the days in closer; FaceTime far away friends, browse through old photos, and I might as well just pack my bags! Yes, it is ridiculous, but what’s a girl to do with so much to look forward to? Now while dreaming of the future is exiting for a moment, I can never fully indulge in my thoughts. Somewhere, in the back of my mind, I know this is not how it is supposed to be. It’s the same feeling accompanied with seeing a 12 year olds’ wedding board on Pinterest. It’s the idea that maybe there’s something better I could be doing with my time than thinking about another day. Even if the most fun of your life is concentrated into 6 weeks, it’s not worth wishing away the 2 years between. So what’s the harm in reminiscing about the past and thinking about the future? Well nothing, if thought of accordingly. Paul says in Philippians ” I thank my God every time I remember you” when talking about his dearly loved friends. He is thinking of his missed ones, praising God for the time he got with them, and praying for their well being. But note, Paul is not saying “like OMG all I do is think of you, and just wait till we are reunited!! xoxo.” It is not a sin to long for something greater, in fact it’s the way we were created; to be constantly yearning for heaven. But It can not always be so wholesome if we let it become a little too much. Excessively longing for something on Earth will almost always distract and discontent. Multiple times this summer we spent vulnerable moments in worship singing “no place I would rather be.” “No place I would rather be, than here in your love.” But not just there in his love. Right here, where ever you are. I wouldn’t rather be at CSU, I would rather be fully and completely abiding and covered in my Savior’s love. It is available and waiting to be experienced anywhere on this great Earth. God doesn’t give us beautiful experiences to idolize them, but because He truly loves his children, this makes him more worthy of praise than any amount of time spent in Fort Collins. We can always be content if God is our joy and our hope, not people or places. God is I AM. Not “I was” or “I will be” but I AM. So when I’m in Fort Worth, Texas, I am going to be completely in Fort Worth, Texas. And eventually when that day comes, I will be fully present in Fort Collins, Colorado. Some people might say I have left my heart in many places. From summer projects and staff conferences, to living overseas and short term mission trips, I have lived lots of life in many different places, all of which I love dearly. But my heart is fully intact, and in fact, it is overflowing. 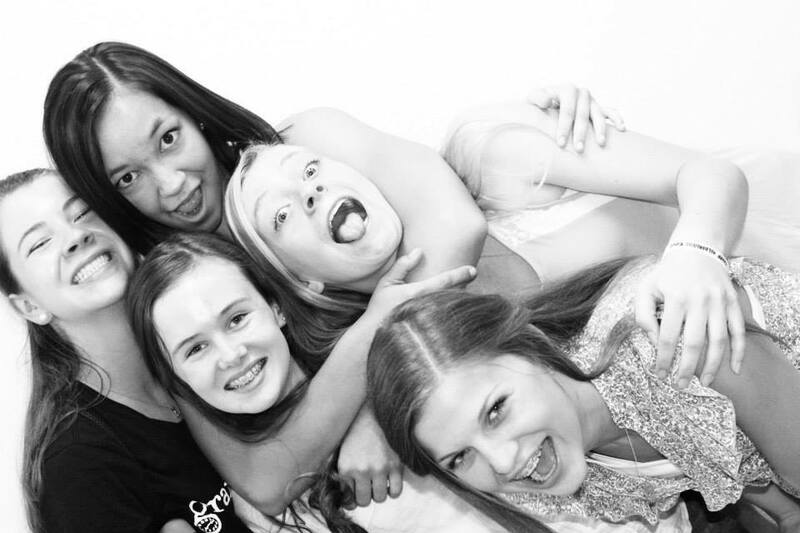 I have not left my heart in any place, I have taken them all with me, in sweet spots that make me smile. So with a full heart I will live every day, glancing ahead occasionally, but focused on where God has me, and content that He is with me.